CLASSES NEAR YOU - Learn 2 Fuse Glass... & More! If you have arranged a Custom or Private Class with me, this is where you will find it in order to Register for the Class! If a Class has been scheduled in another Location... You will Find it Here w/a Link or Info on how to Register! 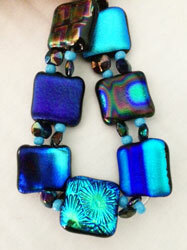 Create: Dichroic Glass Stretch Bracelet! (2) Day Class; SCHEDULE THIS CLASS!